I like the concept of omelettes; it’s feel-good, casual food, the sort that makes you want to roll up your sleeves, get comfortable and dive in. They remind me of lazy weekends and leisurely brunches. There’s something wonderfully comforting and satisfying about a dish that’s equally tasty when made simply with eggs, or spilling over with cheese and other fillings. But omelettes aren’t just weekend breakfast food; they are a fast and filling choice for any meal and there are many reasons to love eggs. 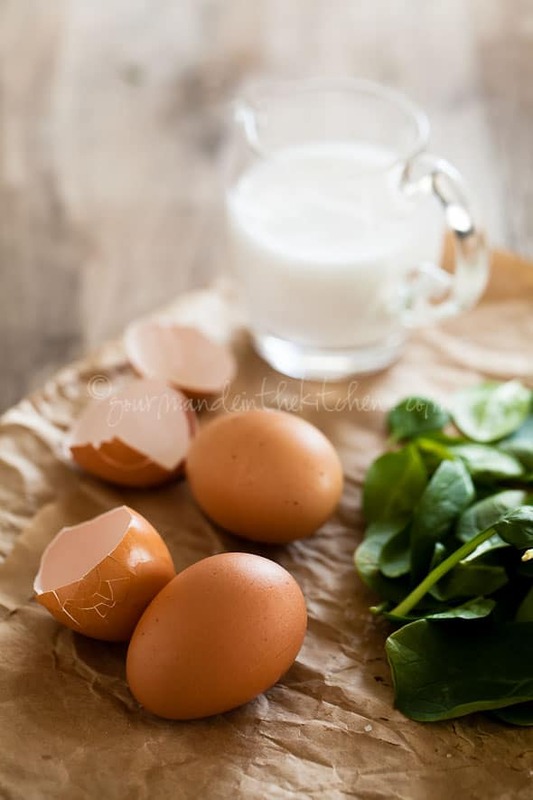 Eggs are good source of high quality protein, high in choline (which has been linked to a reduced level of inflammation in the body) and recent studies have shown that, contrary to previous belief, a moderate consumption of eggs does not have a negative impact on cholesterol. I know there are many authorities on omelette making and various techniques for making the “perfect” one, so many of you may already have your preferred method of preparing an omelette, but this thin green version has to be one of my favorite ways to make it. 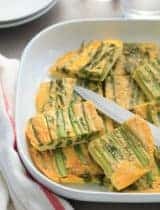 These paper-thin omelettes, flecked with herbs that can double as gluten-free/grain-free crêpes and are incredibly quick to make. In the bowl of a food processor pulse the fresh herbs and spinach until finely chopped. Add the eggs, cream, a pinch of salt and pepper and pulse until well combined. 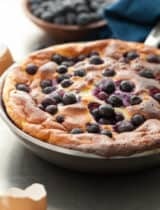 In a non-stick omelet or crêpe pan, melt a pat of butter or spoonful of coconut oil over medium-high heat, tilting the pan so that it coats the surface evenly. When the butter is just beginning to brown, add the egg mixture swirling quickly so that it forms an even layer over the bottom of the pan. Cook just until the egg is set (this should only take a minute or two). It’s done when the edges are dry and the top is just set. Run a spatula around the edges and lift slightly to loosen it from the pan. Plate and fill with salad green and crumbled cheese (if using), folding half of the omelette over the filling. Gluten Free, Grain Free, Vegetarian. Omit cheese for Paleo. *Variation: Use your favorite fillings and another cheese instead of goat cheese. Hello Slyvie I have been eating omelets for breakfast for quite sometime now. Had incorporated sauteed spinach and feta cheese into the eggs and made an omelet before. Now I like the idea of serving some fresh baby spinach and cheese on top, like the way you have done. No doubt, eggs are one of the energy packed start for the day and your recipe is a keeper for sure. I love having omelettes every Sunday morning. I'm not that great at making them look very good though. Yours looks gorgeous! 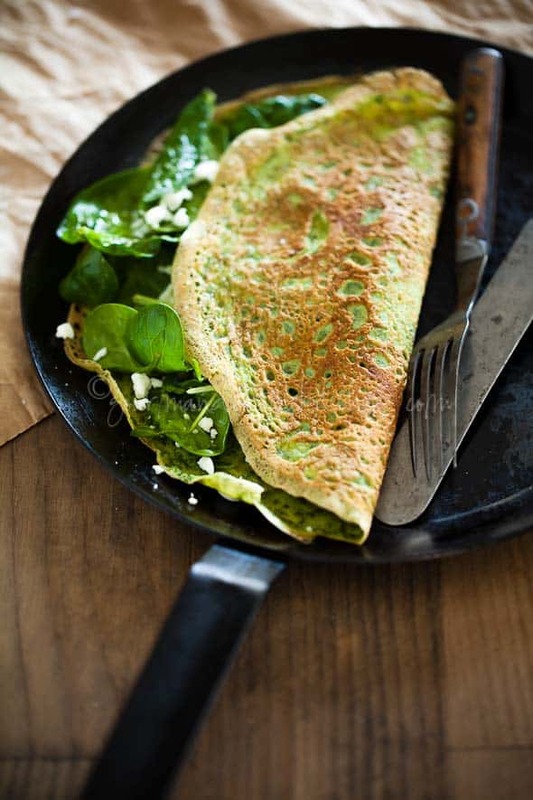 Love the incorporation of greens - a healthier version to most omelettes out there! I can never get bored of egg or anything made with egg and Omelette is my comfort food. I love how we can go crazy creative and make out own version of omelette any time. This is new version for me and sounds delicious! This is such a quick recipe. Pretty & Green :-) Eggs are my favourite food. I think I would die without them, so versatile and always there in an emergency! Hi, I like the fact that this recipe is so simple and healthy at the same time. Most people prepare omelettes with bacon or similar, so I think this one is really refreshing. Easy and quick to prepare. Easy recipe for a brunch. Looks great! I love your photos. I will let my gluten intolerance friends know about this recipe. Thank you, I hope they enjoy it. Hi Sylvie! I haven't visited your blog for a while and I just saw you on another blog so jumped over here. Really happy to be back. :-) This egg omelette reminds me of Vietnamese egg pancake (or whatever it's called). I love your spinach version. Very healthy and beautiful! Hi Nami, nice to hear from you. Yes I know what you're talking about, the ones that are super thin. Eggs are my favorite things- I actually eat them for dinner a lot too when I'm not bothered to cook. We like ours with watercress and lots and lots of cheddar! Oh and spring onions! Love these! Such an easy yet filling and delicious breakfast. And so healthy, too. Clever you, Sylvie. Never occurred to me to make my eggs crepe-style. Super idea to mix the fresh herbs right in; gives your omelet/crepe such a lovely color. Can't wait to try it. Oh Sylvie, that is just the kind of thing I love to eat! Especially this time of year when we've got GREEN springing up everywhere. I'm a sucker for a good omelet, especially one that uses free range, organic eggs. And this looks like magic. Love the spinach and herbs! fabulous! I am featuring this on my fan page today! Sylvie, these paper thin omelettes look incredible! They remind me of Chinese egg crepes. I definitely need to make these...perfect as crepes, low carb and gluten free for me. Sounds like the perfect breakfast. Goat cheese and spinach are high on my list of food to eat day in and day out, and I've been obsessed with eggs lately, too. Gorgeous as always. And I'm really craving this for breakfast now. Sounds like the perfect way to start the day. Yum! i just had a crepe yesterday at Balthazar! delicious. yours looks so healthy and wonderful. I love omelettes. I usually mix all the ingredients into the egg batter and make the omelette. I should try your way too; it'll keep the veggies fresh and more flavorful. I LOVE this, Sylvie! What a great idea and such a healthy way to have an omelette. The green hue on the omelette makes it even more appetizing! Holy crap that is one BEAUTIFUL omelette. I'm moving in! I love, love the new looks of your site. Really chic, esp the header! Omelette is my fave food, but I've never seen such beautiful green colored eggs before. Delicious! Oh Sylvie, that omelette looks wonderful! I can't wait to go home and try out your technique for super thin omelettes. These are so pretty, Sylvie! I love crepes and even better are these being flourless! The spinach and herbs are a wonderful addition too! Can't wait to try it! Beautiful - I've never had flourless crepes, but they look wonderfully light and elegant. Mmm, this looks like a perfect lunch to me - I love eggs for lunch :D The green is so pretty too! I think my son will love a green omelet(or just green eggs in general) I'll have to try that soon! 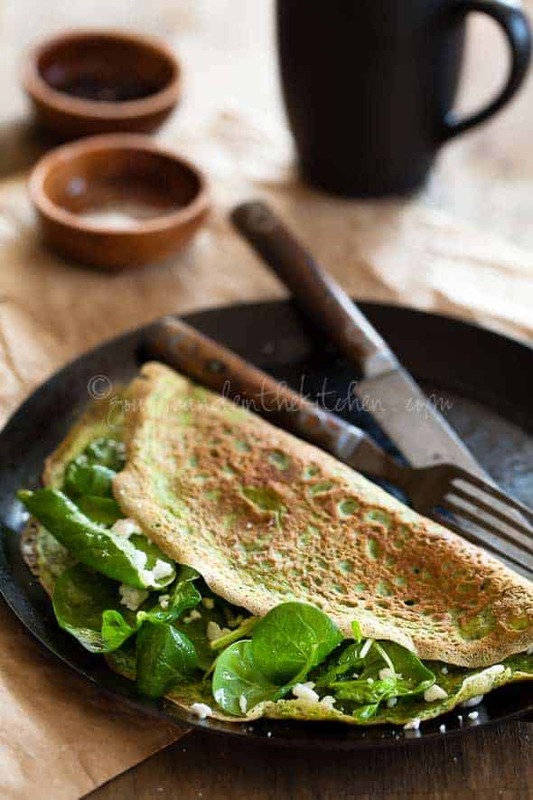 This omelette looks wonderful, what a great idea to make crepes out of eggs, and serve them with spinach and feta. I love that you added greens to the eggs! Sounds like a great breakfast. Sylive, Everything you make looks so amazing through your photography! These crepes & omelets are so scrumptious looking. Easy and delicious! Thanks for sharing the recipe! Such a great idea when I'm cutting the carbs. And, so pretty too. Of course, I love anything green. Sylvie, these omelets are perfect! Love eggs over here too for every reason you mention. The green color from the herbs is so pretty! I love the green color it gives! Sometimes I add coriander chutney to omelet and it gives similar green hue. Spinach is another favorite but need to try goat cheese with it! This looks so healthy and delicious Sylvie. I'd never thought to include coconut milk in an omelette. Great idea though. I'm going to try this. My favourite way to eat eggs is Omelette and I love the fine texture of this and that it is green! This is exactly the recipe I've been looking for! 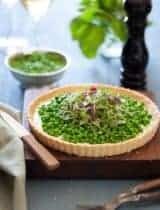 My boyfriend's going on a keto diet as of next week and I'm looking for as many delicious carb-free recipes as I can. 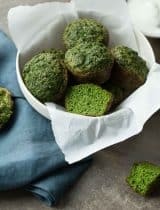 These look so delicious and light - yum! yum yum! 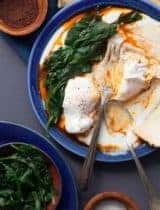 I eat eggs every single day and am always looking for new recipes. I never thought of rolling a thin omelette for a meal on the go - must try that! thanks for sharing your wonderful recipe and stunning photography with us. This is brilliant!! I love the simple technique you've used here to turn a simple omelet into something else entirely. 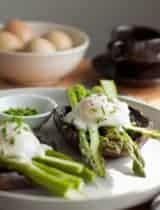 I love eggs and will surely be trying this this weekend. MMmmmmm....healthy, easy and delicious! My perfect breakfast! I'm more of a thin omelette gal also! I am absolutely in love with this idea, and will be making it ASAP. Gorgeous photos, as usual. Gorgeous! And I love the tip about warming up the eggs. I never thought of that! I can't wait to try it! Clever clever! I love making omelettes although mine are usually of the not-so-healthy, loaded with cheese, bacon & mushroom variety ;o) Great idea to make them thin to double a GF crepes - also great for those doing the low-carb thing... and I adore the colour! Lovely recipe! I like your clean and sleek new blog design! I always love a good omlette. This one looks so perfect, love the green in there! I honestly think I have omelettes more often for what I call Brinner. Breakfast for dinner! 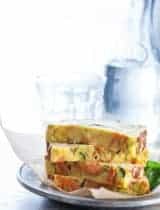 If not in the mood or don't have the time to cook I find that a combination of ingredients either fresh or leftover can make a fabulous omelet meal. THIS is gorgeous! So gorgeous Sylvie! You are right, this is the perfect any time meal! We love omelettes at our house, and my kids have become experts at making them too. One day, my friend down the street said her son (6) came home and started making omelettes after my son taught him how :-) Your "thin" version looks delicious! I have just finished dinner, but I wouldn't mind eating this omelette... Fantastic! Great recipe S! I haven't seen such a pretty looking omelette. i love making omelets. Or add some leftover veggies from the night before and turn it into a satisfying brunch meal. Your photos are stunning as usual Sylvie. 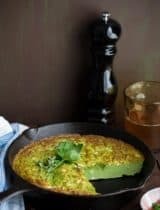 What a cool& fresh idea to make savoury greenish omelettes!! I love them so much! My husband makes "killer" omelettes, and we love them! We usually like avocados,sauteed bell peppers/onions and cheese in them, but I am definitely going to try the fresh spinach. Yours sounds fabulous, and it looks lovely. this is such a great idea!! the crepes are beautiful! Wow, this looks beautiful, Sylvie! Outstanding recipe and extra extra gorgeous Clicks. Hey, just cooked this, amazing! Used lettuce, ruccola and fitaki cheese as a filling. Thanks for the recipe, its officially the best omelette I have ever had.